Chicken enchiladas offer a rich and complex combination of flavors and textures, but traditional cooking methods can be tedious. 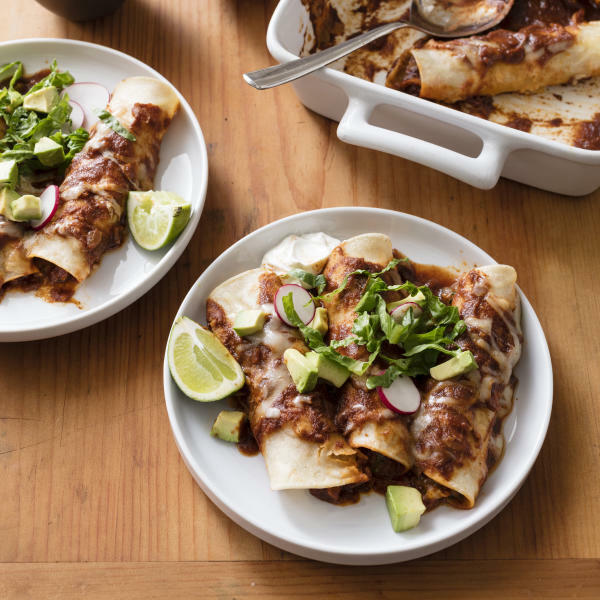 We wanted a more streamlined recipe for chicken enchiladas_one that utilized our slow cooker to make the filling and that enabled the enchiladas to be quickly assembled and finished in the oven. First we created a simple but flavorful red chile sauce with onion, garlic, spices, and tomato sauce, then braised chicken thighs directly in the sauce, which both enhanced the flavor of the sauce and ensured moist, flavorful meat for our enchilada filling. Monterey Jack cheese complemented the rich filling nicely, while canned jalapenos and fresh cilantro rounded out the flavors and provided tang and brightness. When it came time for assembly, we brushed the tortillas with oil and microwaved them to make them pliable. After experimenting with oven temperatures and times, we found that baking the assembled enchiladas covered for 15 minutes in a 450 F oven resulted in perfectly melted cheese, and the edges of the tortillas did not dry out in the process. Serve with sour cream, diced avocado, sliced radishes, shredded romaine lettuce, and lime wedges. Microwave onion, 2 tablespoons oil, chili powder, garlic, coriander, and cumin in bowl, stirring occasionally, until onions are softened, about 5 minutes; transfer to slow cooker. Stir in tomato sauce and sugar. Season chicken with pepper and nestle into slow cooker. Cover and cook until chicken is tender, 4 to 5 hours on low. Transfer chicken to cutting board, let cool slightly, then shred into bite-size pieces using 2 forks. Combine chicken, 3/4 cup sauce, 1 1/2 cups Monterey Jack, cilantro, jalapenos, and lime juice in bowl. Season with salt and pepper to taste. Adjust oven rack to middle position and heat oven to 450 F. Spread 3/4 cup sauce over bottom of 13-by-9-inch baking dish. Brush both sides of tortillas with remaining 2 tablespoons oil. Stack tortillas, wrap in damp dish towel, and place on plate; microwave until warm and pliable, about 1 minute. Working with 1 warm tortilla at a time, spread 1/3 cup chicken filling across center of tortilla. Roll tortilla tightly around filling and place seam side down in baking dish; arrange enchiladas in 2 columns across width of dish. Pour remaining sauce over enchiladas to cover completely and sprinkle with remaining 1/2 cup Monterey Jack. Cover dish tightly with greased aluminum foil. Bake until enchiladas are heated through and cheese is melted, 15 to 20 minutes. Let cool for 5 minutes before serving. Nutrition information per serving: 460 calories; 227 calories from fat; 25 g fat (9 g saturated; 0 g trans fats); 105 mg cholesterol; 1014 mg sodium; 30 g carbohydrate; 5 g fiber; 5 g sugar; 28 g protein. For more recipes, cooking tips and ingredient and product reviews, visit https://www.americastestkitchen.com. 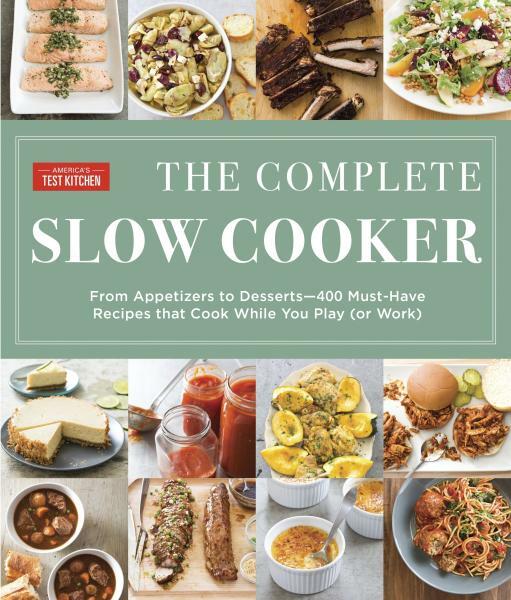 Find more recipes like Chicken Enchiladas in "The Complete Slow Cooker ."